Polls taken in the last year, forecasting the 2018 midterm elections, tend to point towards a Democratic victory in the House of Representatives. Yet party finances, the driving force behind American politics, tell a very different story. The quantitative truth of 2017 is that the Republican National Committee (RNC) significantly out-fundraised the Democratic National Committee (DNC), and has better managed their funds. Greater heaps of campaign funds in the RNC coffers could suggest poor Democratic performance in 2018, even when the Republican president holds office with an approval rating under 40%. The parties are still reporting fundraising totals, but filings show that the RNC has raised over $130 million this year in new donations, while the DNC raised a mere $60 million. Even worse for the Democrats, the DNC sits roughly $4 million in debt with an additional $3 million in loans, while the RNC has no debt and holds substantially more cash on hand. In the 2014 midterm cycle, both parties raised roughly $200 million each and spent almost all of it on the 435 House candidates and several dozen senate candidates running that year. By November, reaching this number, or greater, is the ultimate goal. Since candidates spend an average of $9.24 for every individual vote they receive, every dollar counts. With such an unpopular Republican president in office, the first question is why this shocking fundraising discrepancy exists. The simplest explanation would be that since the midterms are close to a year away, Republican mega-donors (such as the Koch brothers) have already donated, while liberal mega-donors (like George Soros) have yet to sign their checks. However, evidence suggests the contrary, as the RNC reports that much of their $130 million came from small donors who gave 200 dollars or less. As a whole, Republicans seem more motivated to give to their party than Democrats. This difference in level of motivation may stem from the fact that pro-Trump conservatives see the current presidency as a unique opportunity to enact their policy preferences, and feel more urgency to aid that outcome by donating. Yet, as events like the Women’s March demonstrate, Democrats in 2017 have felt outraged by the Trump presidency and seem just as motivated engage in and donate to political causes. In fact, Democrats ought to be even more motivated, as taking the House of Representatives in 2018 would best obstruct the President Trump’s objectives and possibly lead to his impeachment. 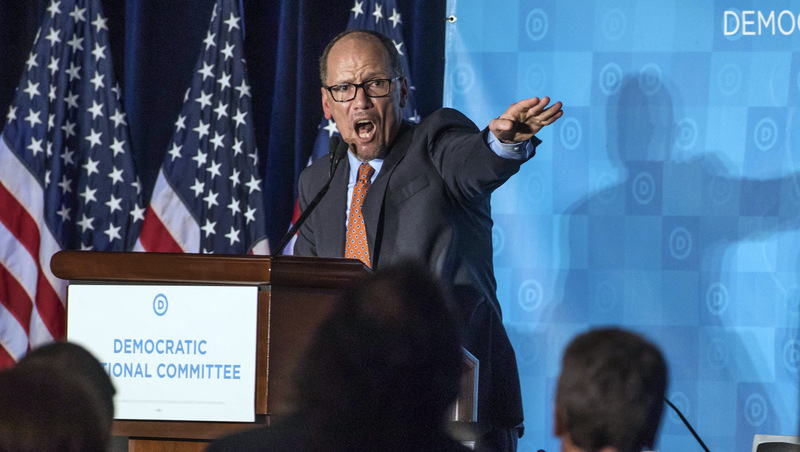 Because the DNC was mired in scandal during the Clinton campaign, another explanation may be that citizens see the DNC in a more negative light than the RNC, and demonstrate greater hesitation before writing a check. This accusation is also not totally unfounded, as former DNC chairwoman Debbie Wassermann Schultz did not allocate funds in 2016 as wisely as the RNC, leaving the DNC with the aforementioned debt and loans that must be repaid. However, much of the rhetoric speculating corruption in the DNC is based on falsified information and conspiracy theory. This explanation is no comfort to Democrats, as it suggests that the fundraising discrepancy will persist, yet it could be a good sign that liberal non-profits that support Democratic candidates are receiving donations that make up for the fundraising discrepancy, as donors that want to give to Democrats, but have a problem giving funds to the DNC, donate to these non-profits instead. Many organizations, such as MoveOn.org, that support liberal candidates have been around since the 90’s, but newer non-profits such as Indivisible and Swing Left have risen to prominence since the 2016 election and could have a balancing effect that counteracts the DNC’s relative weakness to the RNC. The current RNC chairwoman, Ronna Romney McDaniel, should also receive some credit for the RNC’s advantage. She is reported to take a much more aggressive fundraising stance than her predecessors at the RNC and DNC, traveling over 88,000 miles over the course of the year for fundraising events, and staying in constant contact with the Republicans’ largest donors. Furthermore, from November to December 2017, she commissioned the collection of a new e-mail list of over 1 million Republican party members who now receive regular e-mails encouraging donations. It is difficult to get a parallel sense of how the DNC behaved during this time period, since they have not made such information public (perhaps due to the lack of success to boast about), but we can assume that their fundraising strategies were more conservative than McDaniel’s. Ultimately, there is no satisfying answer for Democrats on the question of weak fundraising, even as pundits point towards the likelihood of a “Blue Wave” sweeping the country in 2018. Observers should wake up to the possibility, even if it is an unlikely one, that a strong RNC edges out a weak DNC, despite the Republican president’s extremely low 40% approval rating.